This is the fourth Society for Marine Mammology Conference I have given a poster presentation but the first in my own right, without being affiliated with an overseas academic institution.1275 abstracts were submitted for the conference and 299 reviewers from across the globe reviewed them. Positioned in the middle of the North Atlantic humpback whales' migratory journey from their southern breeding grounds to their northern feeding grounds, Bermuda provides an ideal platform to study pelagic humpback whale behavior. Humpbacks are observed in Bermuda waters from late December to mid-May, a wider time window than previously known. Challenger Bank, a shallow (50m) seamount fifteen miles SW of Bermuda, is one of many seamounts on the humpbacks' migratory route. Dedicated research over the last decade has provided over 1,250 individual humpbacks IDs. Layovers in Bermuda of up to eleven days have been recorded. The similarity of dates of annual re-sightings indicates that the humpbacks may maintain fidelity to a fixed migratory timetable. In five of the last six seasons newborn calves have been witnessed in Bermuda waters in late December and early January. This database, combined with underwater and aerial video observations, provide additional insights into the humpbacks' behaviors relative to these environments. Humpbacks observed on the leading edges of the seamount exhibit behaviour consistent with foraging and aerial footage reveals defecation. Resting pairs of stationary humpbacks are often submerged for long periods with breathing cycles of up to 50 minutes duration. Underwater footage in shallow water off Bermuda reveals humpbacks exfoliating in sand holes. Aerial 4k video discreetly details the humpbacks' complex social behavior. Competitive groups of males fighting in the presence of a female seen in February/March indicate breeding behavior . Surface-active clusters of non-combative humpbacks of as many as sixteen individuals in late March early April can be witnessed over some days. Hydrophone recordings evidence prevalent singing, centered on Challenge Bank. The statistical data combined with underwater and aerial footage reveal communal behaviour that implies the mid-ocean seamounts are a socially significant environment beyond being merely a transitory corridor from breeding to feeding grounds. 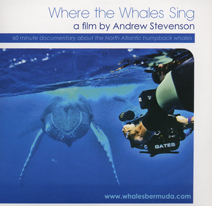 2017-05-08 A film documentary sequel to "Where the Whales Sing"